You can prevent the natural darkening or browning of the avocado flesh that occurs with exposure to air by sprinkling with a little lemon juice or vinegar. If its already ripe, make sure to then seal any leftovers in a plastic bag or plastic wrap and put in the fridge, where it will keep for up to a week. Don’t refrigerate any avocados before they’re ripe though! If you’d like to know about the reason behind avocados dietary benefits, we’re going to get a bit geeky. First off, despite their green complexion, avocados are technically a fruit, not a vegetable – they have a massive pit and grow from avocado trees. However, they are an incredibly unique fruit in the amount of protein and array of nutrients they provide, as well as improving the absorption of particular nutrients from itself and other foods! Besides potassium, B vitamins, several anti-inflammatory fatty acids, and other necessary nutrients, avocados have a high proportion of oleic acid (healthy monounsaturated fats also from olives and olive oil). Oleic acid helps the digestive system form transport molecules that absorb and distribute carotenoid nutrients. Nine major carotenoids (yes that’s right, the most commonly known source is carrots and other orange/red vegetables) are also found in abundance in avocados, concentrated in the darker green flesh just under the leathery outer skin. What a great combo to have wrapped up in one fruit! You may have heard carrots are good for your eyes, but most carotenoids are also antioxidants, known to give further anti-inflammatory benefits and thus help prevent arthritis and lower the risk of heart disease. The same effect applies to other fruits and vegetables (also high in carotenoids) consumed around the same time – adding a small amount of avocado to a veggie salad or salsa will actually multiply carotenoid absorption from the salad or salsa 2 to 4 times over! You’re missing out on so much without it! Hope you’ve found this as interesting as I did. What dishes do you use avocados for? Our next few recipes will feature the awesome taste and goodness of the avocado, so we’re going to take a moment first to talk about why we like avocados so much, and point out a couple tricks we discovered that can help you out in the coming recipes. First step is selection and knowing when they are ready. Trust me, you don’t want to try to peel and mash a rock-hard unripened avocado – when we first tried, even use of extreme smashing force turned out to be futile in so much as deforming the shape of a tiny cut of unripened avocado flesh. Ripe, ready-to-eat avocados are slightly soft, but without any dark sunken spots or cracks. A pear-like shape is usually an indication that it was tree ripened and will have better flavor. 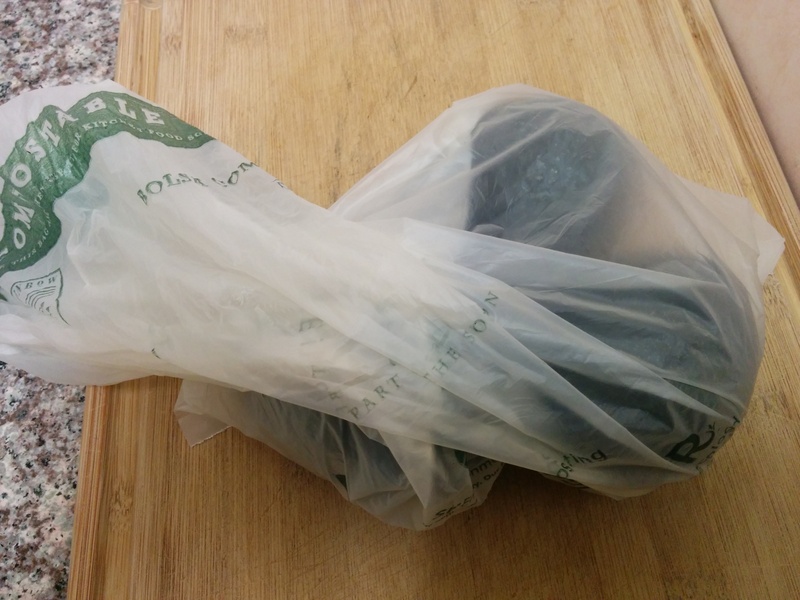 Firm avocados will ripen if left in a paper bag or a compostable bag at room temperature for 1 to 3 days. Intriguingly, if joined by other fruits in the bag, they will ripen quicker. Cut the avocado in half lengthwise down to the pit all the way around. It may help to separate the halves, if clinging to the pit, by rotating each half in opposite directions. 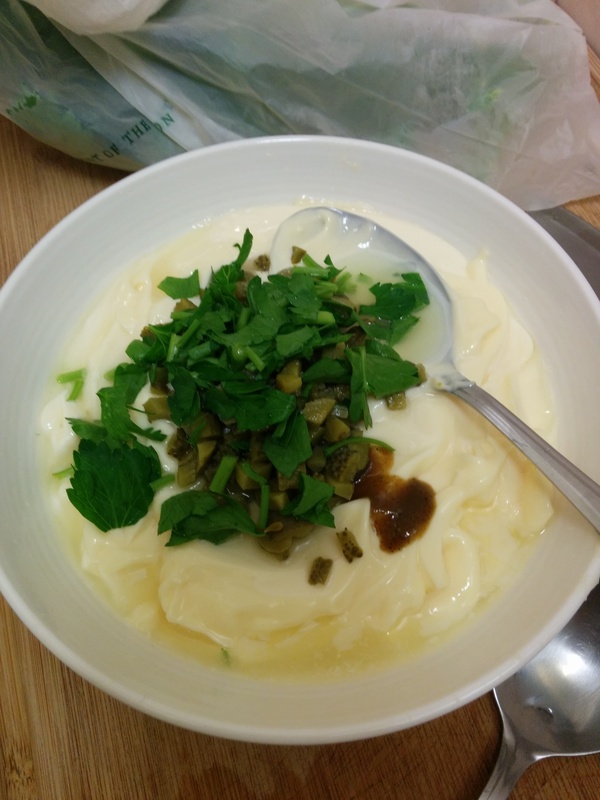 Remove the pit with spoon or knife tip. The easiest way to peel is to then cut each half again to make quarters, and simply peel off the skin all at once using your thumb and forefinger, like peeling a banana. If you messed up like we did and cut into a super unripe avocado (hey, we had 6 sitting around that we had to get through! 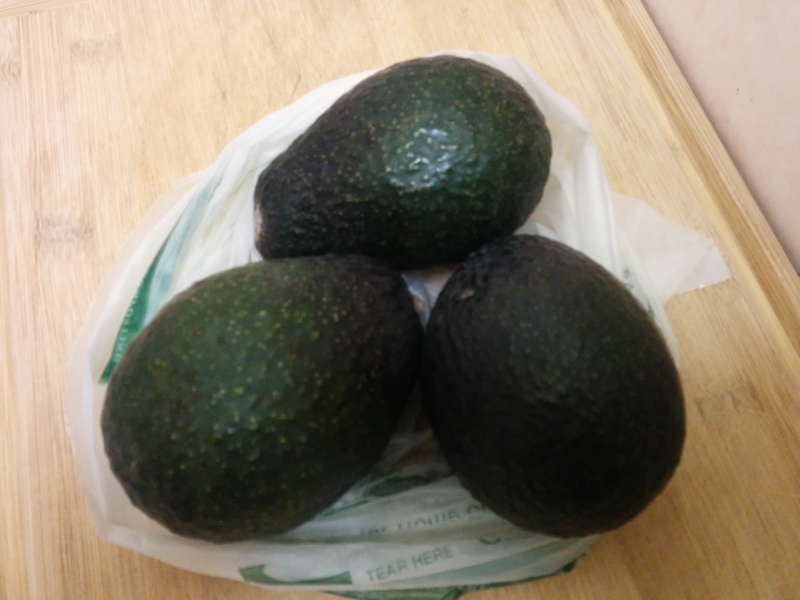 ), there is a trick that can effectively ripen the avocado by softening it up. Wrap the avocado pieces in soaked paper towels and add another cup of water on top in a bowl, and then microwave on high for two minutes. Drain and unwrap, and the pieces should be soft enough to mash, if that was your intention. In general, though, you shouldn’t cook avocado at any high heat since it breaks down a lot of the healthiest fats (more on that later!). 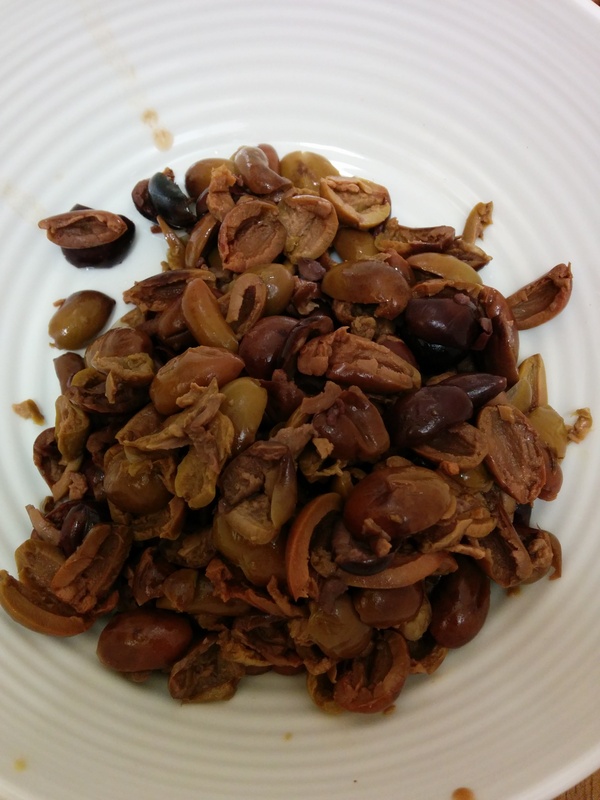 In the unfortunate circumstance that you have unpitted olives while making a dish such as our Puttanesca from yesterday, you will have to go through the tedious process of pitting each olive by hand. If you have a dedicated olive pitting machine, then you can use that, but we certainly don’t in the tiny kitchen! Trust me, you could end up spending well over an hour on this task unless you use one simple trick that makes the process much quicker and easier. The idea is to separate each side of the cut from the pit, resulting in the two olive halves you want. 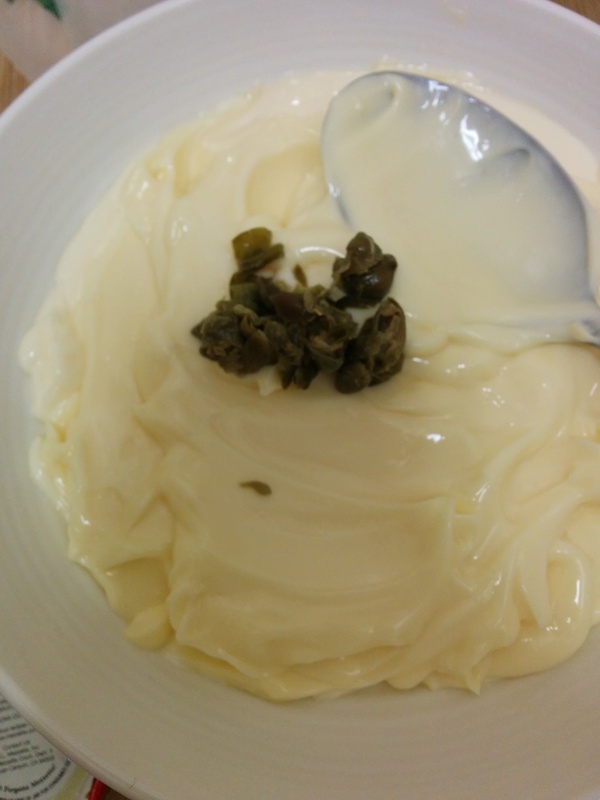 In general, you will notice that the flesh of green olives (which are unripened) sticks more securely to the pit than black olives (which have ripened). Thankfully it doesn’t matter how many smaller pieces of olive you end up with for the Puttanesca, but if you are relying on nothing but fingers alone, you will find that prying the flesh from the pit requires a bit of finger nail length, lots of tedious effort, and many over-cut olives. 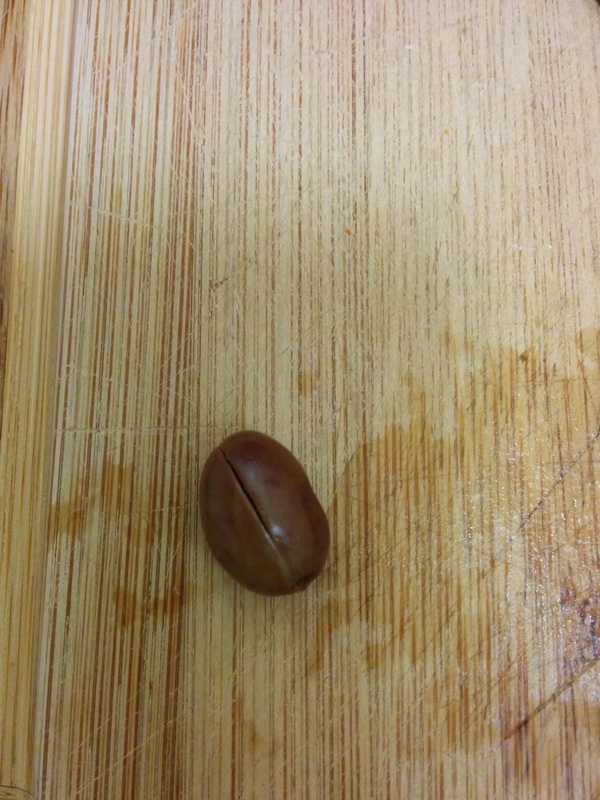 You want to start by cutting a line down the middle vertically all the way down the olive going as deep as the pit. 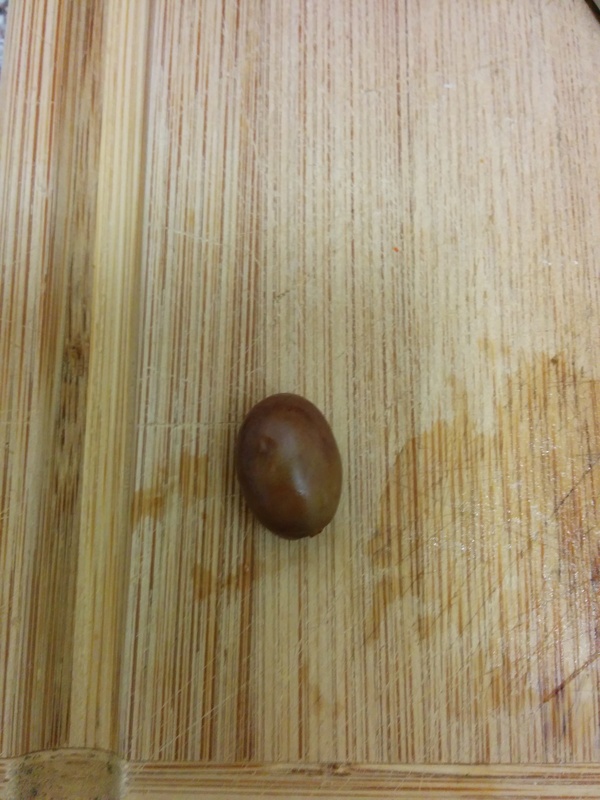 With the cut on each olive facing up as pictured, push down on the olive with the flat of your knife. 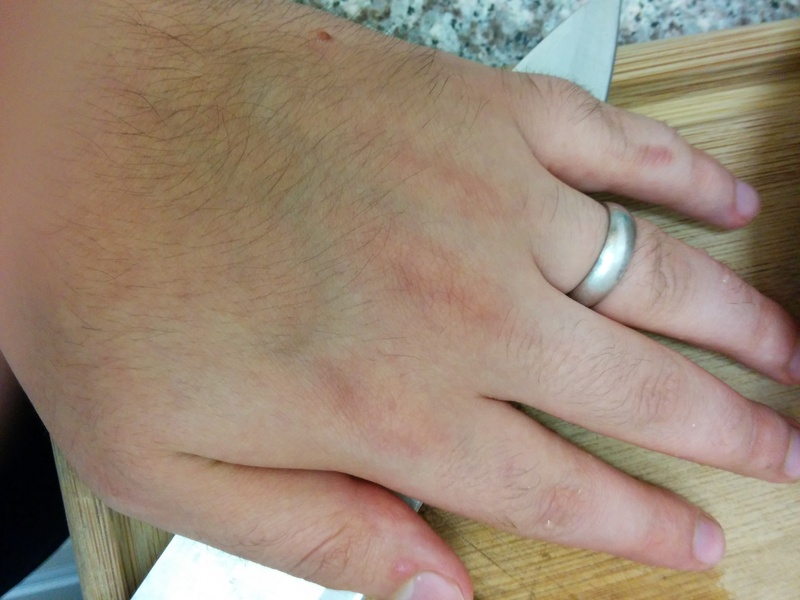 If the pit doesn’t immediately fall out, you can roll the knife back and forth with pressure until it does. That’s it! 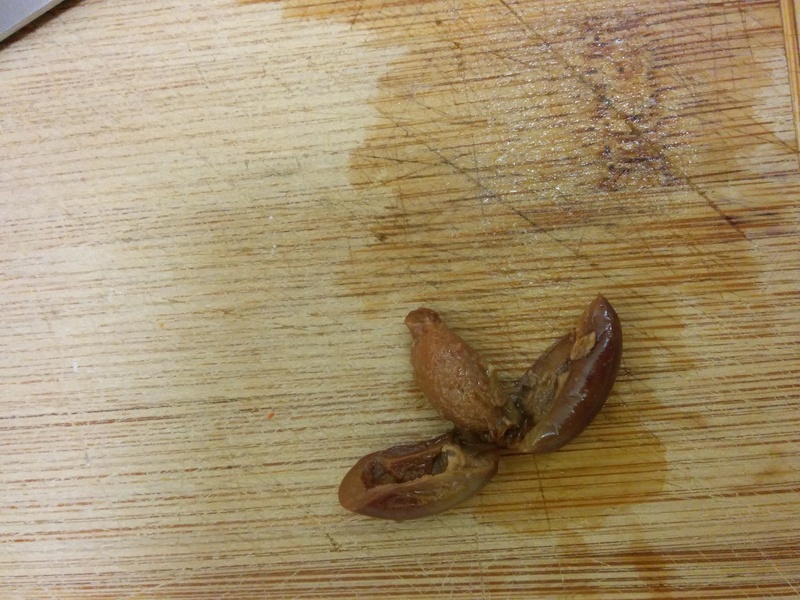 Easily pitted olive halves that were done much faster and more easily than with fingernails. Repeat the process with all the olives you need to pit until finished. Even with a tiny space, we are fortunate enough to have a little storage space so we don’t need to go shopping every single day. Part of that means knowing how to properly store your food. We know that basil can go bad pretty quickly in general, and the cold from the refrigerator doesn’t really help, though leaving it out flat on the counter isn’t great for its shelf life, either. We did learn of a cool new trick, though, that can extend the life of your basil to about a week. 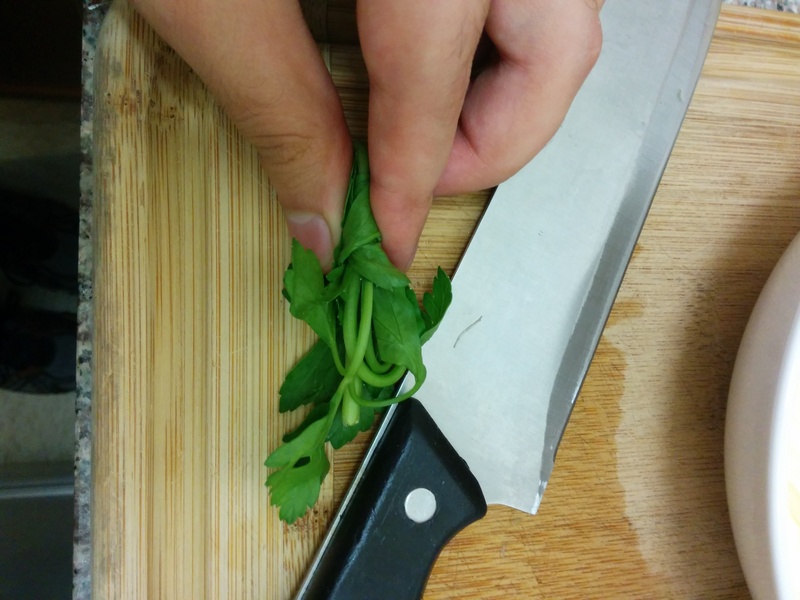 If you chop off the stems for the basil and put it in a pot of water, the basil can better absorb that water and last longer. 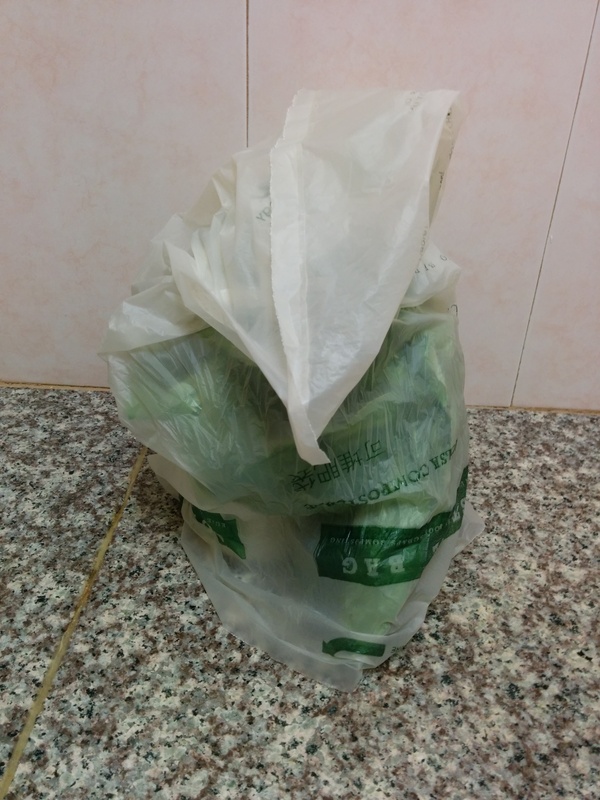 You can also put a bag on top to help trap moisture further. However, you do want the basil to be able to breathe so that the ethylene gas which wilts leafy greens can escape, so leave some space at the bottom for air to get in. Time for a frying classic – french fries. Almost everyone loves them, but very few of us know what it takes to make them great. 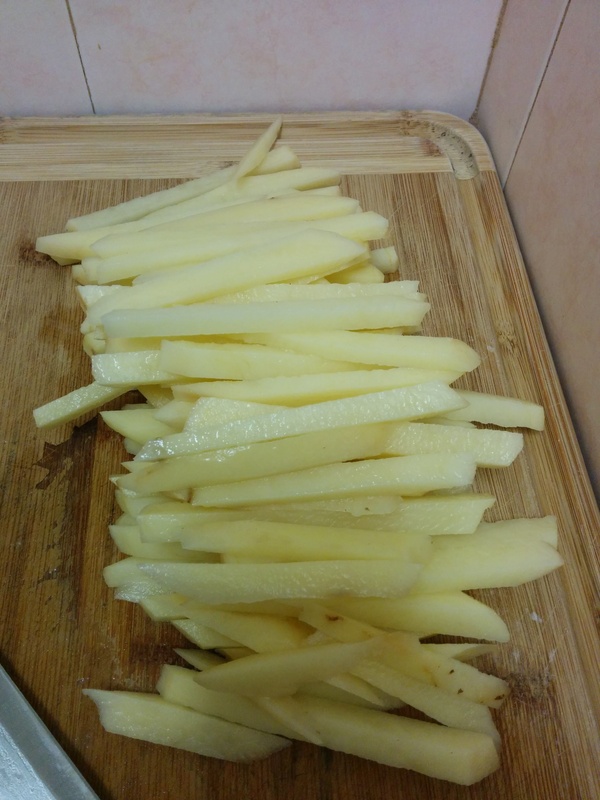 A few keys include a first water-vinegar bath, double fry, and freezing process, as well as using russet potatoes which have the ideal structure for perfect french fries. 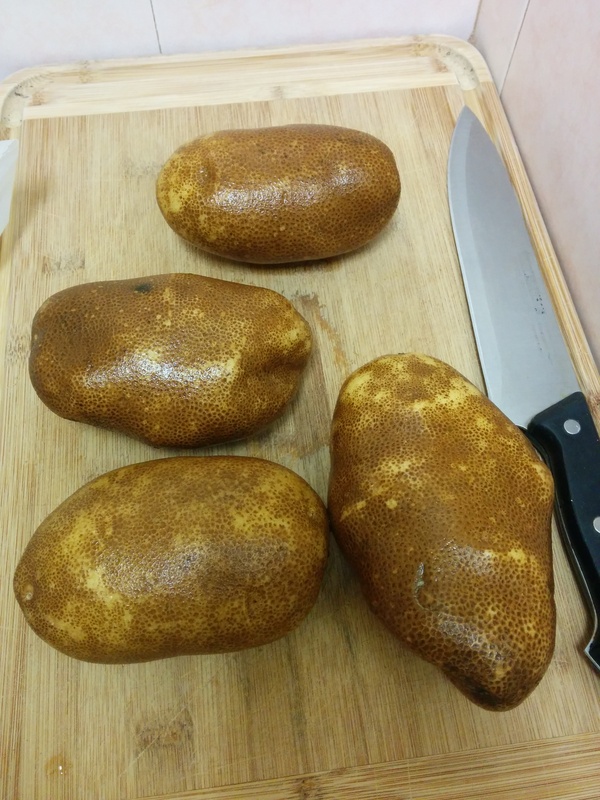 First, the potatoes should be peeled. When you run the potatoes through their bath, the skin doesn’t expand while the interior does, so skipping this step will ruin some of your fries. Next, you want to cut your fries into pieces that are large enough to provide a potato-ey interior, while being thin enough to have enough exterior crunch. 1/4 inch thickness is a pretty good goal – there is a reason that most fast food joints make their fries this size. 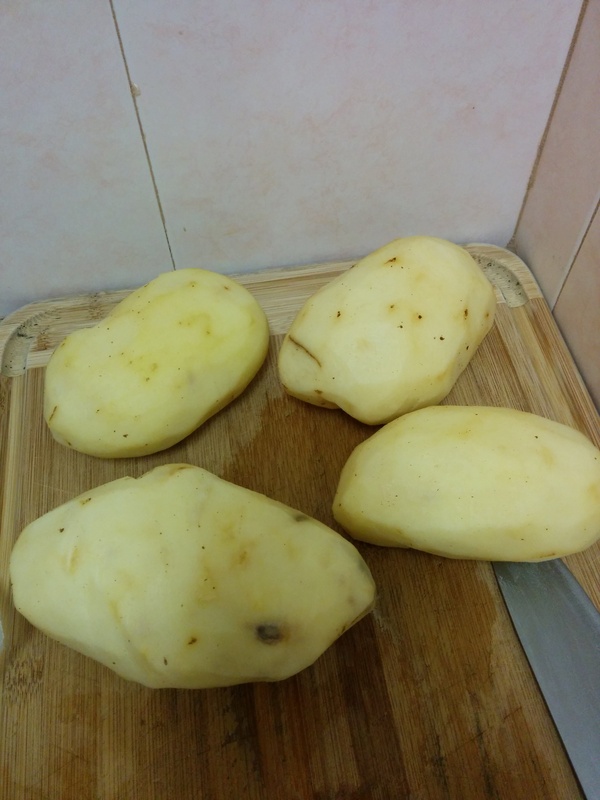 To cut them, simply cut across the potato in 1/4 inch segments, then turn the potato 90 degrees and do it again. Assuming you are using 2 potatoes weighing 1 lb altogether, you will want to put them in about 8 cups of water for their bath. Add 1 tbsp of white vinegar and 1 tbsp of salt. We want to bring the potatoes to a boil over high heat, then boil the fries for about 10 minutes, but keep a close eye on them to be sure they don’t disintegrate. The goal of the bath is to eliminate the simple sugars in the fries which allows them to attain a light golden color during later frying. The vinegar is what protects the fries from falling apart, reinforcing the internal structure so they don’t become hollow tubes during later frying or disintegrating from the boiling now. Be warned, though – disintegration can still happen if you aren’t careful and let the fries cook too long! Next we want to dry the fries out as much as possible with paper towels. 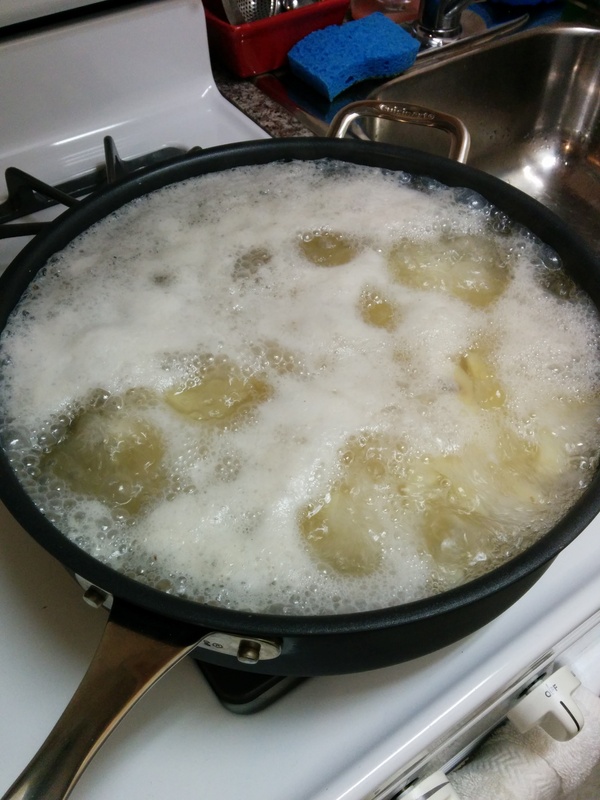 The more moisture that is removed from the potato, the better it will fry later since it won’t get gummy. Be generous with the paper towels, and let the fries sit for about 5 minutes. Once the fries are dry, it’s time for the first fry. 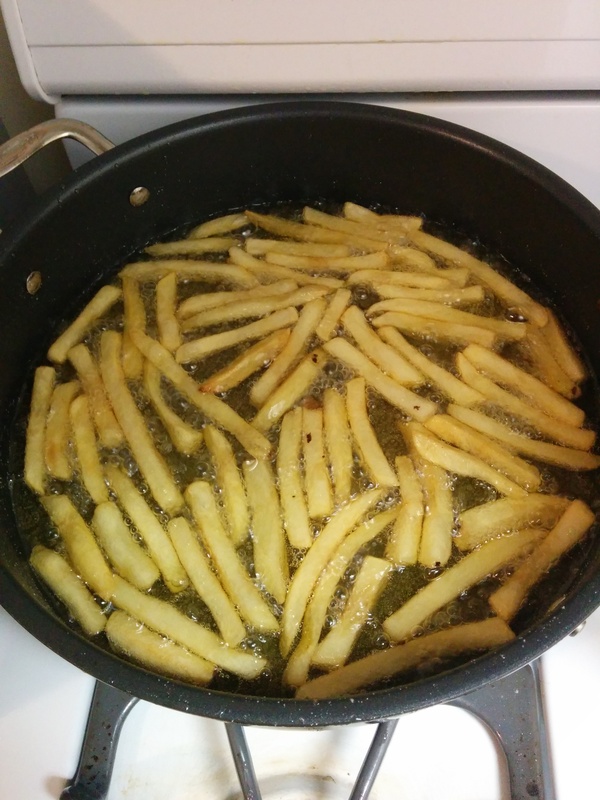 Heat enough oil to cover the fries in a pan or pot until a splash of water sizzles. If you can measure temperatures, you want to shoot for about 400 F. Throw the fries in and do a very short fry for about 1 minute, then remove and dry on a paper towel. Let the oil get back up to temperature and repeat with the remaining fries, letting them all sit out for about a half hour to cool to room temperature. The goal here is to build up a thick, outer layer for the fry that will help it retain its structure. This is really important, because the next step is freezing the fries. 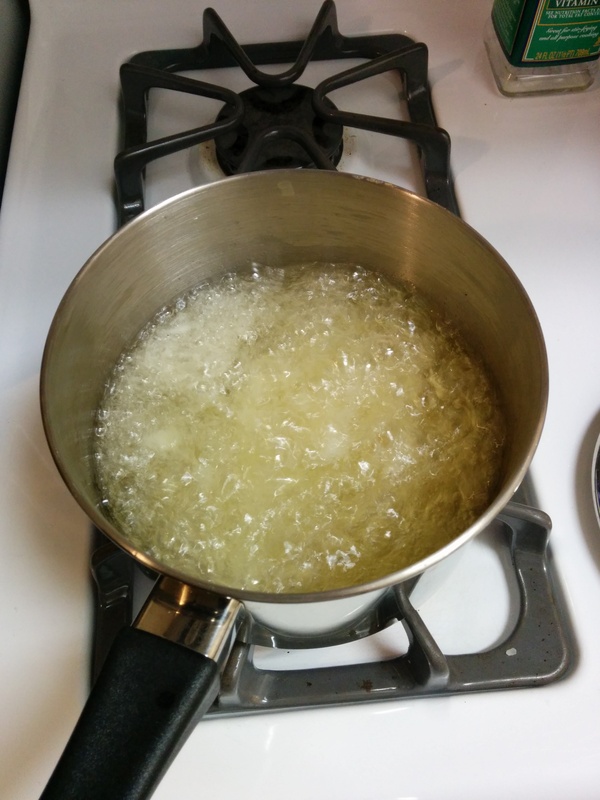 Freezing helps crystallize the internal moisture in the fry so that when you later do the second frying process, those ice crystals get converted to steam which makes for a light, fluffy interior as opposed to a gummy mess. The crisp outer structure that was created during the first fry helps ensure only the interior breaks down in this way. You will want to let the fries stay in the freezer at least 24 hours for this process to happen. The good news is they can keep in the freezer for a couple months, so you can make a big batch. When you are ready to actually serve the fries, the process is incredibly simple. Simply heat up enough oil to cover the fries again at 400 F like before, and fry until they are a light golden brown (about 4 minutes). Season with salt and serve! Most of us have tartar sauce with fish and chips, and in some areas of the country on hushpuppies or other fried foods. 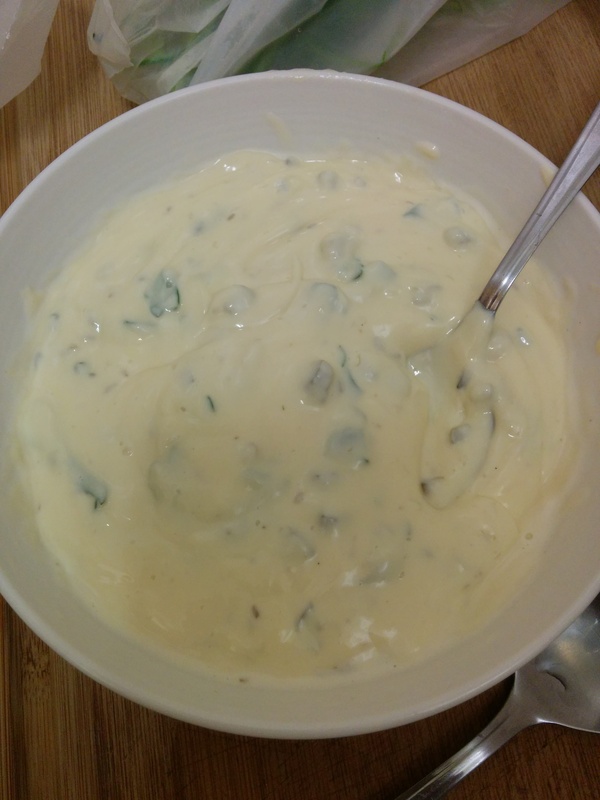 Making a fresh tartar sauce, though, is something that most people don’t consider, simply opting for whatever can be bought in a bottle from a store. That’s a shame, because fresh tartar sauce where you can control all of the ingredients is so much better. 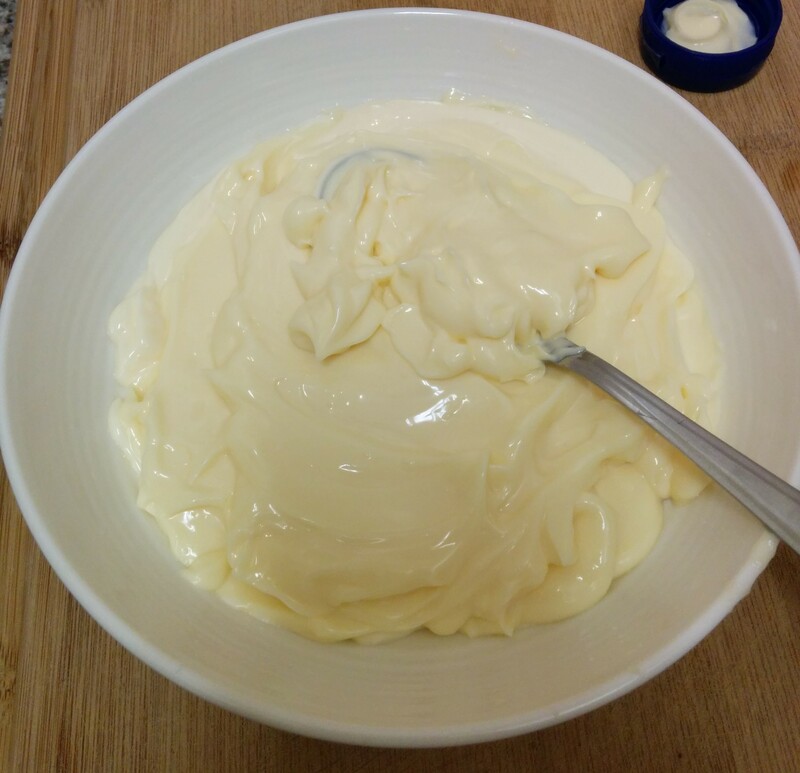 For a decent sized batch, start with one cup of mayonnaise. 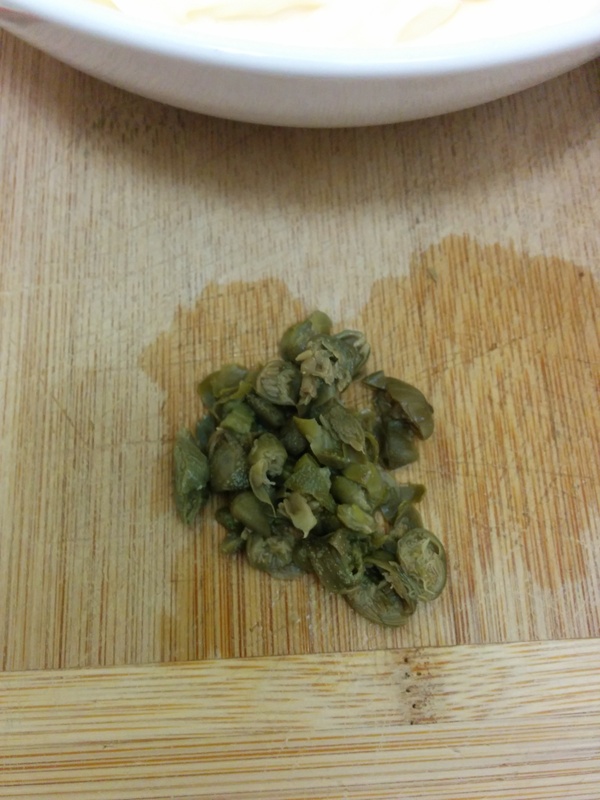 Next chop up about 1 tbsp of capers. These will add a rich, savory saltiness to the tartar sauce as well as provide a bit of color and texture. 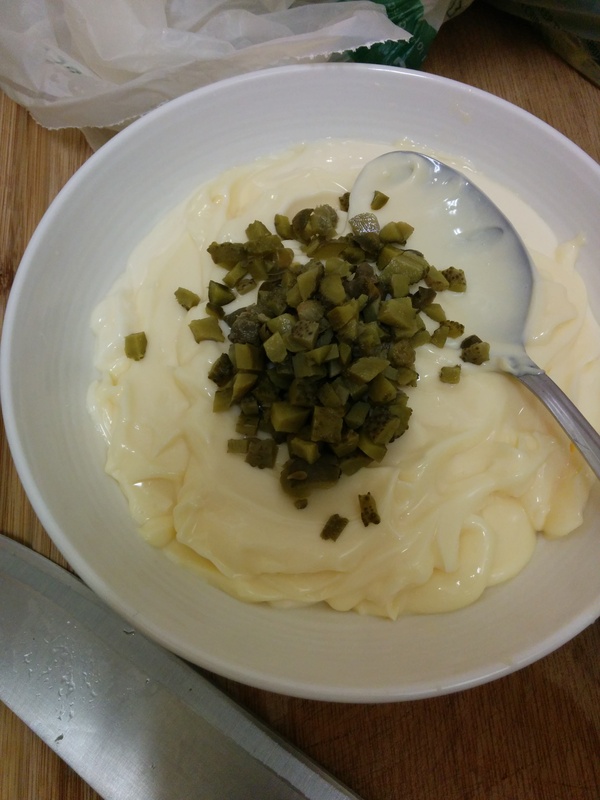 One of the other main parts of tartar sauce is the pickles. The selected pickles should be salty, tangy, crisp and with a good texture. Cornichons are a great option that meets that criteria. Chop up about 6 of them (they are tiny!) in 1/4 lengthwise, then chop across until you end up with tiny pickle pieces. To add a bit of a twist (and some green) we used fresh parsley. Simply roll it up like a cigar and chop it from one side to the other, only going over an area one time. Finally add the parsley, as well as about 1 tablespoon of lemon juice and a dash of your favorite hot sauce for some heat. Stir everything up, and that’s it! You can definitely taste the difference over store bought. Let us know if you come up with any new and creative ways of using it. Eggplant is one of those foods that has a lot going for it. It’s perhaps the meatiest-tasting vegetable there is, and is incredibly filling and savory. Unfortunately, not everyone is a fan of its raw taste. But that’s ok – usually you can convince even the pickiest of eaters to enjoy the flavor after frying it. 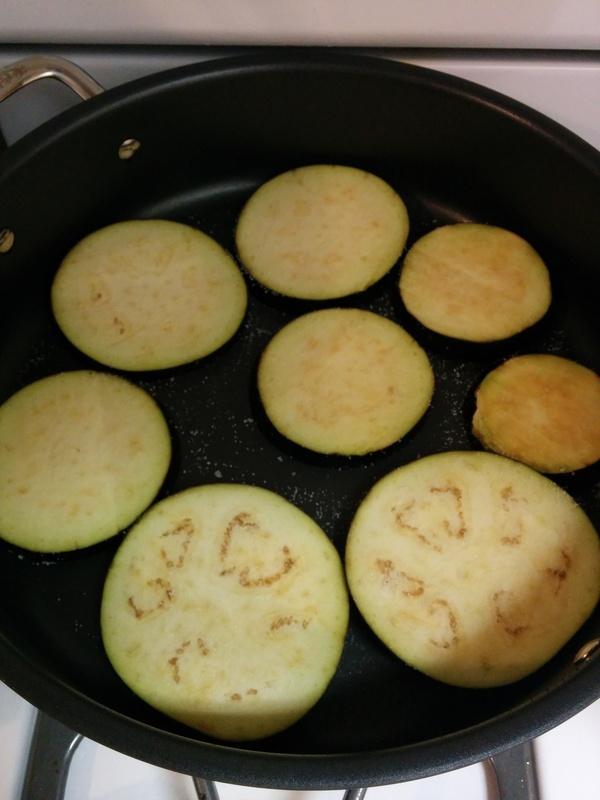 I recognize that frying eggplant isn’t necessarily the healthiest way to consume the nutritional value of this vegetable, but it still beats other things that you might be frying. Fear not, though, fry-lovers! Tips on those other recipes are coming soon. 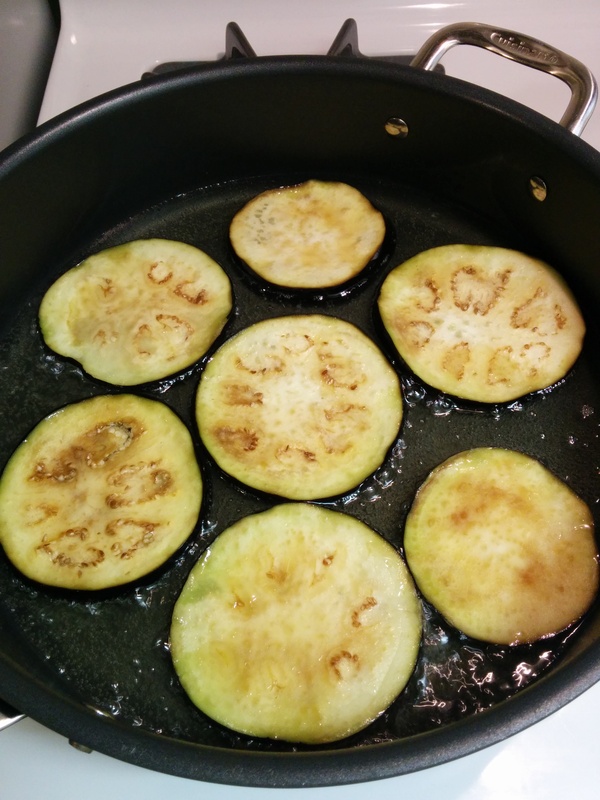 Back to frying eggplant, for now. 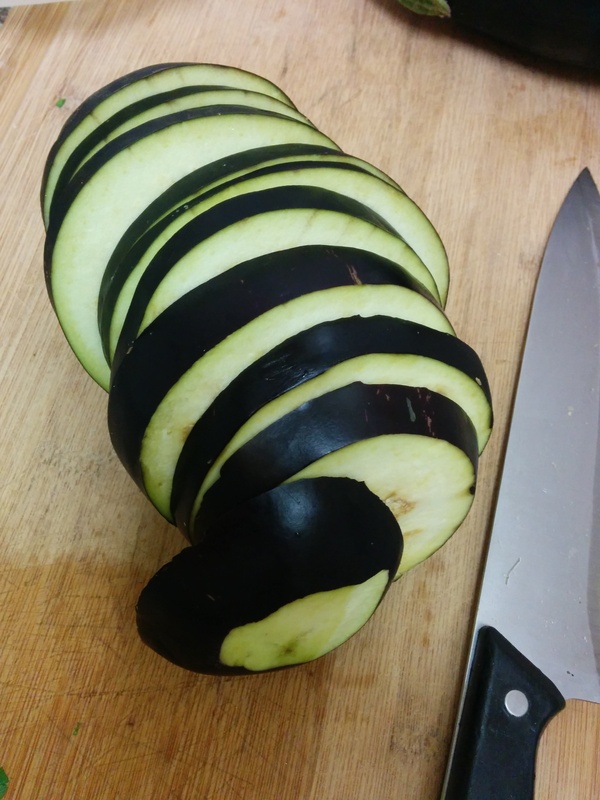 The first step is slicing the eggplant thinly. When frying anything, the thinner your slices, the greater the surface area that will get exposed to the hot bubbling oil during frying, and the “crisper” your fried food will be. What you give up in exchange for that crispiness is less chewy softness in the center (and increased fat content). First cut off the stem. Then cut your slices. A pretty good balance between crispness and meatiness is slices that are about 1/4-1/2 inch thick. 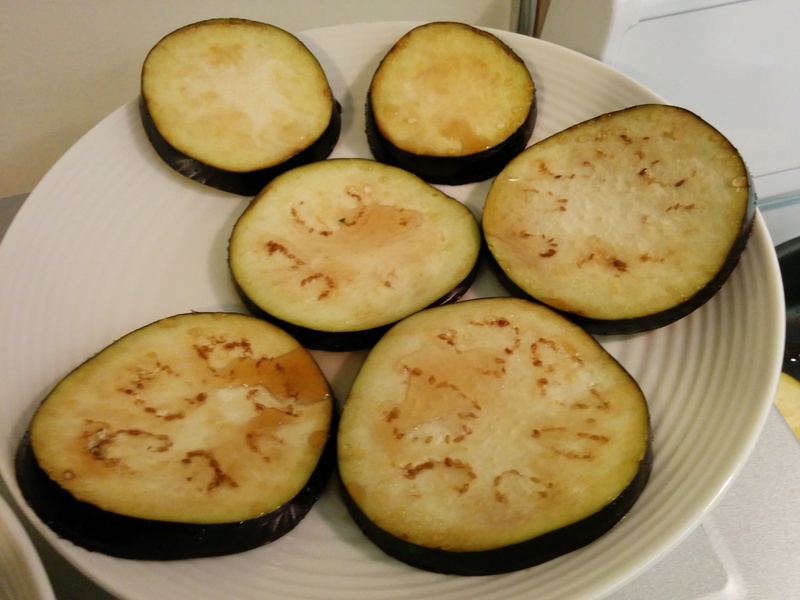 The next step is laying your eggplant pieces out and salting them liberally on both sides. This helps to draw out as much water content as possible, which eggplant is naturally full of. Having drier ingredients when frying is generally a good idea, because moisture can cause the oil to splatter, while drier ingredients produce better results with less frying time. 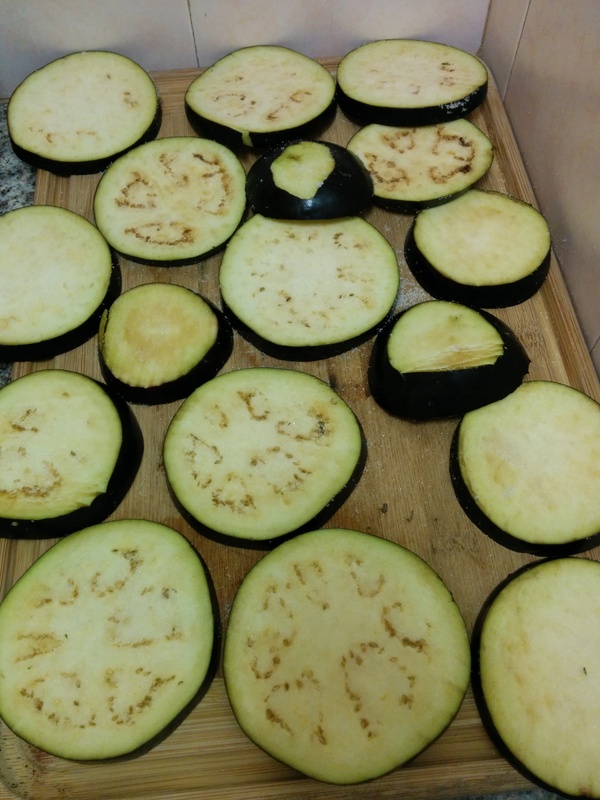 Unfortunately in the tiny kitchen, we had limited counter space to lay all the eggplant out. We ended up doing what we could (e.g. throw it into any available pan and reuse the stovetop space as a drying area). After waiting about a half hour, lots of the moisture of the eggplant will be drawn out to the surface. Use paper towels to fully dry the eggplant on both sides. It is OK to wipe off the salt in this process, since salt can also cause oil to splatter. Speaking of which, it should now be about time to start heating up some oil. You will want to use enough to fully cover the bottom of your pan. Use an oil with a high smoke point, such as peanut oil. 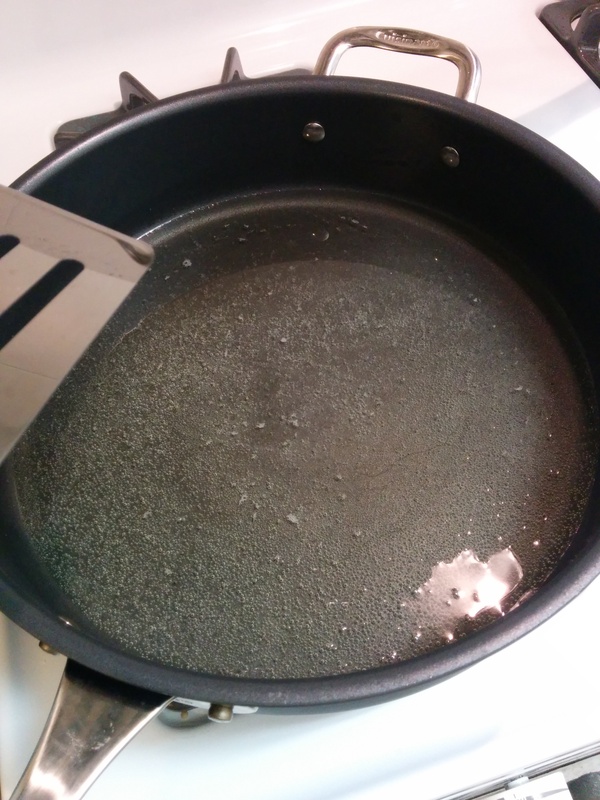 Heat the oil over high until a splash of water sizzles. 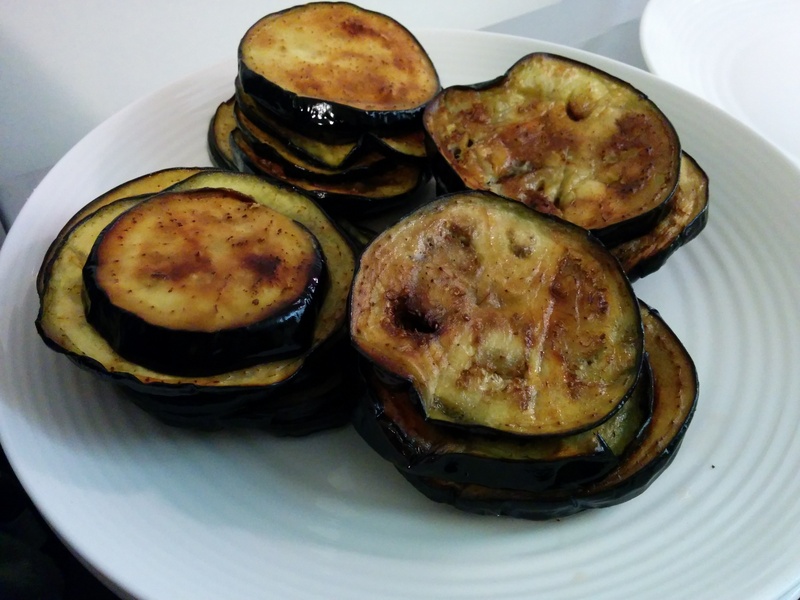 Simply fry the eggplant on one side at a time until lightly browned in batches. When you lay the eggplant out, try to do it in a consistent direction each time so you remember which went in first. Also remember to lay the eggplant away from you rather than towards you as you place them in the hot oil or it may splatter in your face. Speaking from experience, that can be highly unpleasant. 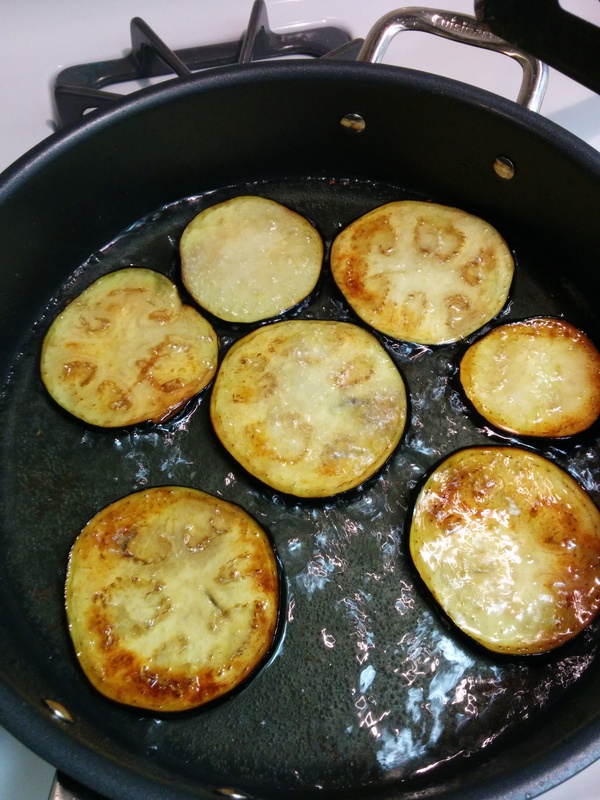 As the eggplant fries, unless you are using a cast iron pan or some material designed to deliver heat evenly across the surface, you will likely notice parts of the pan get hotter than others. The way to solve that problem is rotating the eggplant around the pan. Keep checking the bottoms until they are ready and then flip and fry the other side. 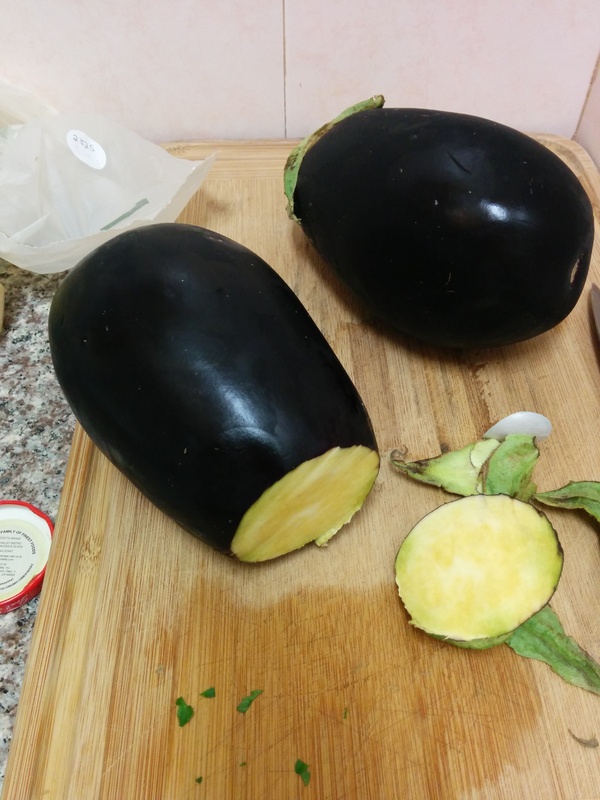 Once the batch is done, carefully remove with a spatula to drain the eggplant of its oil as much as possible and then put the fried eggplant on a plate. After sitting for a few minutes, you may see excess oil pool at the bottom. If so, you can add that oil back to the oil still in the pan which can be used for further frying now, or cooled down and stored in the refrigerator for future use.